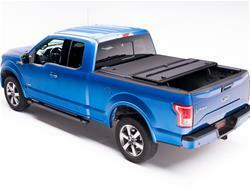 Extang Encore Tonno hard panel tri-fold tonneau covers offer superior design and protection for your cargo. These low-profile covers provide easy access from both the front and rear, with the ability to fold up either panel to load or unload cargo. Encore Tonno tonneau covers use SecureShut technology, a heavy-duty rear latch to lock the covers at the tailgate, with a separate rotary latch at the front panel for cargo security. Self-locking pins position the tonneau on rails for a perfect fit and heavy-duty aluminum extruded hinges support the covers. Extang Encore Tonno covers are engineered with 1 in. thick SunStrong fiberglass-reinforced plastic panels that keep these covers cooler, while providing excellent UV protection. Their textured, powdercoated frames and rubber corners are resistant to nicks and scratches, and their advanced sealing system offers ultimate protection from the elements. If you're looking for superior quality, great looks, and easy access, Extang EncoreTonno tonneau covers can't be beat!